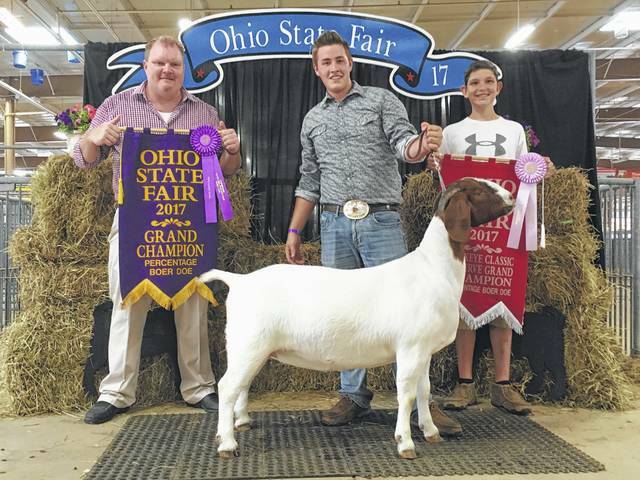 Drew Pontious (far right), pictured with his cousin Chas Grover, had the Grand Champion Percentage Boer Doe in the Open show, Reserve Grand Champion Percentage Boer Doe in the Buckeye Classic, and Reserve Yearling Champion Percentage Boer Doe in the Jr Show during the 2017 Ohio State Fair. Pontious also was fourth in intermediate breeding showmanship and was third place in breeding showmanship in his age division. https://www.recordherald.com/wp-content/uploads/sites/27/2017/07/web1_DrewPontious.jpgDrew Pontious (far right), pictured with his cousin Chas Grover, had the Grand Champion Percentage Boer Doe in the Open show, Reserve Grand Champion Percentage Boer Doe in the Buckeye Classic, and Reserve Yearling Champion Percentage Boer Doe in the Jr Show during the 2017 Ohio State Fair. Pontious also was fourth in intermediate breeding showmanship and was third place in breeding showmanship in his age division.